We aim keep our fees competitve, fair, simple and provide excellent value for money at all times, which allows our client relationships to blossom. On becoming a client, we will provide you with details of the services you have requested and their associated costs in an Engagement Letter. However, if services are carried out, which are not included in the Engagement Letter. Then, fees for these services will be agreed and invoiced separately. We will agree our fee with you in advance for the services you have requested. Thus, provide you a total peace of mind. 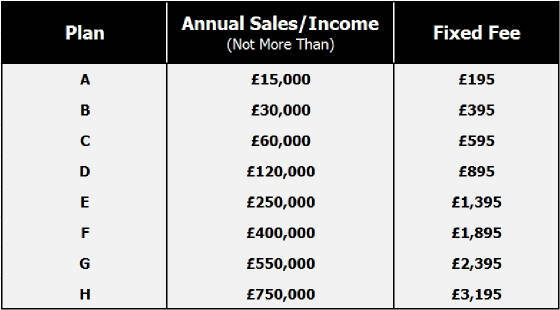 Our fixed fee plan is dependent on number of factors, however for guidance please see below fixed fee plan based on your annual sales/income. Businesses/individual with annual sales/income more than £750k are welcome to discuss your specific requirement of services in relation to accounting and tax affairs. The traditional method, which is still favoured by many. You are charged according to the time we spend in dealing with your affairs and the levels of staff involved in order to complete the work. We try to accommodate suggestion from our clients. Thus, we have introduced this pricing plan. Where we can agree a fixed fee with you for certain services, while providing other services based on traditional method of an hourly rate basis. When you have selected a fee plan that best suit your need. Then we will agree one of the following payment plans with you. This is available with all our fee plans, however works particularly well with the fixed fee plan, as it spreads to an agreed amount over the course of the year. Please note the monthly standing order will be calculated by taking the factors like our fee plans and your accounting year end. The traditional route. For instance we charge you as and when we complete a particular piece of work (i.e. on accounts preparation, VAT return, and Tax return etc. ), or alternatively pre-agreed intervals. You are required to settle up with us within 7 days from the date of or invoice. To reassure you, which ever payment option you choose, we keep your statement of account with us up to date , so a statement is available to you at any time. We strongly recommend our clients to join Fee Protection Scheme that we can arrange. Investigations by HM Revenue and Customs can be random or specific at any given time to particular professions or trades. What does the scheme provide? It is not possible for us to prevent you from being investigated by HM Revenue and Customs. However we can help to ensure that you get the best possible support and advice without having to worry about the cost.